Visiting Assoc. Prof. of Electrical Engineering & Computer Science, M.I.T., 1978-79. In the fall of 1978, a course entitled "Introduction to VLSI Systems" was offered by M.I.T. 's Department of Electrical Engineering and Computer Science. This document is a compendium of information concerning that course. It is intended to serve as a basic guidebook for instructors preparing similar courses. Copyright c 1979, Lynn Conway. All Rights Reserved. 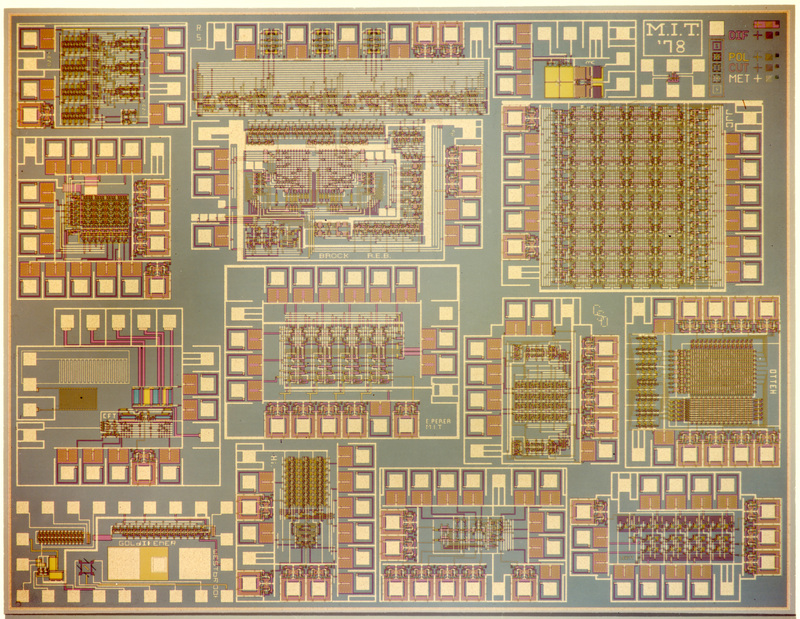 A VLSI Archive Page compiled by Lynn Conway [V 11-15-07]. This guidebook was developed for use by instructors, teaching assistants and project coordinators offering Mead-Conway VLSI design courses in the fall of 1979 and later. The guidebook was aimed at providing those instructors with all essential technical information required to offer a successful course in the new Mead-Conway VLSI design methods. The "Instructors' Guidebook" was based on the handouts, lecture notes and results from Lynn Conway's M.I.T. '78 VLSI design course, which had been tremendously successful at M.I.T. Being a bit shy at the time, Lynn had "overprepared" very detailed lecture notes for every lecture in the pioneering M.I.T. course. This turned out to be a great blessing in hindsight. As a result of the great success of the M.I.T. course, Lynn was bombarded with requests for information - and realized that her lecture notes could be highly exploited to help others offer similar courses. The key was exploiting her detailed lecture notes, notes that showed exactly what to cover to provide the essential knowledge needed to undertake VLSI design (but no more than that, thus avoiding a lot of existing material over-complicated things and prevented good top-down design by compartmenting chip design into many subspecialties). Soon after the returning to PARC in early ''79, Lynn compiled the instructors' guidebook from all the handouts, lecture notes and homework assignments from the M.I.T. course. Later that spring she began sending out copies of the guidebook to instructors planning courses for fall of '79. 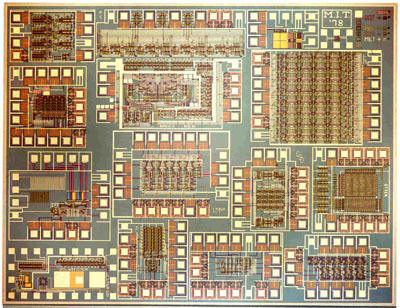 By that fall 12 universities offered Mead-Conway VLSI design courses using the new textbook Introduction to VLSI Design just published by Addison-Wesley, in a huge ramp-up of activity leading up to MPC79 (the multi-university multi-project chip implementation effort in late 1979). 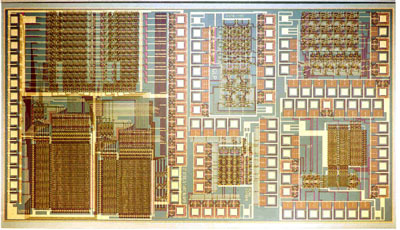 All 12 MPC79-related courses operated on a schedule whereby students learned the basics of digital design in nMOS VLSI in the first half of the semester, and then carried out design projects in the second half of semester - with their prototype project chips being implemented shortly after the conclusion of the course. These courses needed to run on a well-synchronized schedule, patterned after the course Lynn had pioneered at M.I.T. In order to insure the success of these courses, Lynn sent off copies of the "Guide to the Instructor of VLSI Design" and drafts of the related "Guide to LSI Implementation" to all the instructors involved in MPC79. Following the success of MPC79, the Mead-Conway textbook was adopted by scores of other universities, and Lynn sent copies of the two guidebooks to all those instructors too (eventually sending guidebooks to instructors in almost all universities offering Mead-Conway courses). As a result, the "instructors guidebook" established the underlying course syllabus for the new form of VLSI design courses, and enabled courses to get off to a rapid start at over 110 universities by '82-'83. The widespread use in the universities of the "instructors' guidebook" and the "implementation guidebook", along with the Mead-Conway text, greatly boosted the launching of such courses and rapidly spread a common technical culture of VLSI design and implementation based on the Mead-Conway methods. The sudden spread of this technical culture among a new generation of university students (beginning in the fall of '79) then triggered a revolutionary breakout of entrepreneurial activity in the '80's, as many young entrepreneurs seized opportunities for making major innovations in chip design, CAD tools and related foundry services. The table of contents below links to into an online version of the course syllabus (further below) containing links to scanned PDF's of all the individual lecture's notes and all course handouts. Those links provide easy access to specific lectures and handouts without downloading the complete guidebook. See also Lynn's VLSI Archive Spreadsheet, for direct links to local sections and chapters in this and many other archive documents. > Abstract of the course. > Goals of the course, relevant student backgrounds and interests, and required prerequisites. > A detailed outline of the course (with links to the detailed lecture notes for each lecture). > Discussion of the sort of class projects required. > Design tools and procedures required for class project implementation. > Letter to participants, indicating the status of the projects. > List of student LSI projects. > List of the participating organizations and schedule for chip set implementation. > Map of the M.I.T. '78 multiproject chip set. > Photomicrograph of the M.I.T. '78 multiproject chip set. > A complete set of notes for the seventeen formal lectures and for the various other class meetings of the MIT. course (see the detailed Outline in part 1). The notes were handwritten out in detail, this being the instructor's method of lecture preparation. Note that a few figures were in color in the original notes; hopefully the reader will be able to deduce the correct colors for these figures. > Homework was assigned only during the first half of the course, before the project activities began. The homework emphasized material and experiences useful as background for planning and working on projects. Specific project assignments were given to keep the students on schedule during the short, intensive project phase of the course. > Student Background Questionnaire; other questionnaires. > Examples of the Wire-Bonding Maps returned to students with their packaged chips. Prereq. : Limited Enrollment; permission of the instructor required. An introduction to the design and implementation of very large scale integrated systems. The course provides sufficient basic information about integrated devices, circuits, digital subsystems, and system architecture, to enable the student to span the range of abstractions from the underlying physics to complete VLSI computer systems. The course presents basic procedures for designing and implementing digital integrated systems, including a structured design methodology, use of stick diagramming, use of a scalable set of ratioed design rules, use of a symbolic layout language, techniques for the estimating delay times, and use of a starting frame of layout artifacts for organizing multi-project chip sets and conveying them thru implementation. The course also examines the effects of scaling down the dimensions of devices and systems, as will occur with future improvements in fabrication technology. After developing this overall context, the course examines the interdependance of integrated system architecture, design methodology, and the procedures used for patterning, fabrication, and testing. Techniques for simplifying, systematizing, and reducing the time involved in integrated system design and implementation will be discussed. The subject matter will be reinforced by actual experience in LSI design: students will complete, through layout, the design of digital subsystem projects containing on the order of several hundred to perhaps several thousand transistors. NMOS will be used as the technology for course examples and projects. Selected student projects will be organized into a multi-project chip set to be implemented by commercial mask and fab firms. (i) for CS students and those interested in computer architecture: to take the mystery out of integrated circuit and system design, explore some of the many CS issues involved in integrated system architecture and design methodology, and indicate the exciting possibilities ahead for the expansion of computing power by VLSI systems. (ii) for EE students and those interested in device physics and integrated circuit design: to get a feeling for the nature of the chips that will be designed in the future, take some of the mystery out of the design of complex integrated digital systems, and illustrate the additional opportunities for optimization at the system level as opposed to the device and circuit layout level. (iii) for all participants: to outline the many opportunities now present for major advancements in the state of the art by collaborative efforts involving applied physicists, electrical engineers, computer architects, and computer scientists. (iv) to develop and debug a set of basic tools and procedures for enabling the design and implementation of LSI multi-project chip sets at M.I.T. Ideally, students will have taken the following prerequisite courses, or have the equivalent background experience: Introductory Network Theory (6.011), Electronic Devices and Circuits (6.012), Structure and Interpretation of Computer Languages (6.031), Computation Structures (6.032), Switching Circuits, Logic and Digital Design (6.082), Digital Systems Project Laboratory (6.112). However, those lacking the required prerequisites (including recommended undergraduates) may take the course with the permission of the instructor. Carver Mead and Lynn Conway, Introduction to VLSI Systems, July 1978; a pre-publication limited printing of a textbook in preparation; distributed to course participants. This textbook will be published by Addison-Wesley Publishing Co., Reading, Massachusetts, in the fall of 1979. MOS as an Abstract technology. Patterned conducting layers separated by insulating material. Color coding, Switches, Simple logic structures, Some examples. Dimensions, basic function, transit times, current/voltage characteristics. Structure, function, transfer characteristics, logic threshold voltage, intro. to delays. NAND and NOR logic circuits. Logic gate vs switch-logic designs for selector. Ch.l: Intro., MOS Transistor, Basic Inverter, Inverter Delay, Basic NAND and NOR Logic Circuits. Ch.3: Intro., Notation, Combinational Logic. Transit time and inverter pair delay. Relating Different Levels of Abstraction . Implementing a Stack: the basic cell. More stick diagram-level designs (two-dimensional stack, several PLA examples). Stack subsystem design, control timing, generation of control signals. Basic concept, Circuit design, and stick diagram of example. Basic concept, use of PLA form of, symbolic and encoded transition tables, traffic light controller example. Ch.3. Two-Phase Clocks, The Shift Register, Relating Different Levels of Abstraction, Implementing Dynamic Registers, Designing a Subsystem, The Programmable Logic Array, Finite State Machines. The Silicon Gate n-Channel Process. Design Rules, basis for and detailed description of. 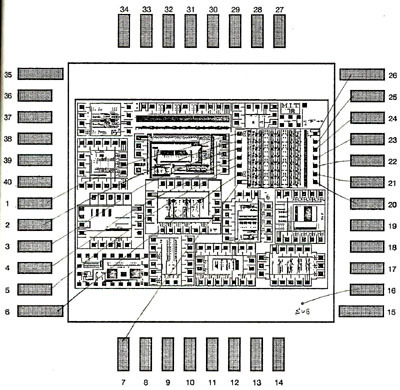 layout of compact shift register cell; layout of stack cell. Review the process, discuss some advantages of Silicon-Gate process over earlier ones. Explanation of sheet resistivity; estimating ratios and resistances from layout geometries. Current limitation in metal lines. Go thru some layout examples: selector; shift register. Ch.2. Patterning, Silicon Gate n-Channel Process, Design Rules, Electrical parameters, Current Limitations in Conductors. Depletion mode vs enhancement mode pullups. Stick diagram and layout of serial bit string comparator. Detailed description of an OM2 subsystem: the Barrel Shifter. Description of function and structure of the serial bit string comparator (to get people started on HW #4). Ch.l. Driving large capacitive loads, super buffers. Hand Layout and Digitization using a Symbolic Layout Language. The Caltech Intermediate Form, detailed description of, including tutorial on transformations. Description of the sorter subsystem (to get people started on HW #5). Ch.4. Hand Layout and Digitization Using a Symbolic Layout Language, The Caltech Intermediate Form. [The Lab opens this week (CIFtran now ready)]. Keyin and plot OF code for HW #5; Select course project and write a short project proposal. Discuss plan for remainder of course: what will be in the final project assignment schedule to be handed out next week, planned seminar series, the midterm, some rules of the game for projects. Description of lab facilities, CIF software for editing/plotting of layouts. Detailed discussion of the sorter subsystem problem. Construct stick diagram for the Sorter Problem. More on course schedule/project schedule, rules of the game, area estimates. Transit Times and Clock Periods. Ch.l. Delays in another form of Logic Circuitry, Transit Times and Clock Periods. Handout the Guide to LSI Implementation, discuss contents, suggest readings. Discuss how class chip set will be implemented. Describe cell library, particularly the PLA cells and Input/Output pads. Detailed description of the multiproject. chip concept, starting frame, past examples. #2 (Due Nov.9): Detailed project description. #3 (Due Nov.21): Preliminary layout (a key item for determining chip set space comittments). #4 (Due Dec.12): Final project reports. More on implementation: Interacting with mask and fab firms. What happens when the wafers come back: electrical characterization, packaging, functional testing. During the next several weeks, read the first half of Chapter 5, and Chapter 6. Interactive Graphic Aids for Integrated System Design. A two hour examination on the basics covered so far. Effects of Scaling Down the Dimensions of MOS Circuits and Systems. Discuss the Scaling of Transit time, Electrical parameters, Current, Current density, Power density. Project Assignment #2 Due Today. The opportunity for remote-entry, fast-turnaround implementation of designs. Discussion of the relative area, power, delay, and overhead circuitry for a variety of on-chip memory subsystems, including the shift register, the OM2 register cell, the 6-transistor static RAM, the 3-transistor dynamic RAM, and the 1-transistor dynamic RAM. Project Assignment #3 Due Today. Discussion of project status so far. Beginning to allocate space on the chip set. Update on the rules of the game. Selected preliminary project design files will be transmitted to PARC this week, for individual project plotting and checking at PARC, and to test the overall data transmission scheme. Electrical test patterns for electrical characterization and process parameter extraction. Q and A session to pin down final details. Four projects (from among those already selected for inclusion in the chip set) will be selected for presentation to the class by their designers. Discussion of the final status of projects, distribution of plots arriving from PARC, discussion of various known bugs in the various software packages and how to get around them, contingency plans, getting ready for the upcoming design cutoff date, how to sign-off on your design file. Selected portions of Chapter 8. Projects.- Today is the design cutoff date, all project design files must be at PARC for merging into the MPC tomorrow. Project Assignment #4 (Final Project Report) Due Today. Status of the projects: list of those that got on the chip set. Multi-project chip set progress report: how the implementation is going. Planned activities during IAP, after the wafers are returned. Much of this course's material, while basic, is new and is not yet part of the academic EE/CS culture. Thus, a strictly lecture oriented course faces tutorial obstacles, as the terminology, artifacts, and abstractions involved will be completely new to most students. A solution is to orient the course around hands-on LSI digital design projects. Actual design experience will enable students to quickly visualize the overall context of the course. Early in the course, students will define and begin work on LSI projects on the order of useful digital subsystems based on a single cell design, such as a stack, FIFO, etc. Alternatively, the student might design a simple finite state machine controlling a very simple data structure; the traffic light controller in the text is the sort of thing I have in mind here, but with a bit more than just the PLA itself implemented in LSI. By doing these designs top-down, under time pressure, learning the material as they proceed, with homework each week oriented around the projects to keep everyone on schedule, the students will master the material. Students having the listed prerequisites should be able to complete their projects in the available time. Those who have completed what appear to be workable projects by an early December multi-project chip design cutoff date will have the added satisfaction of seeing their projects implemented. All students must complete their projects thru checkplot of full layout by December 12. In addition to these projects, students having strong software backgrounds might volunteer to also participate in group projects to provide software support for the editing, plotting, and implementation of the LSI design projects. Similarly, students having strong device physics and integrated circuit backgrounds might volunteer to participate in a group project to provide circuit simulation support for the LSI design projects. Other volunteers from the class will be sought for participation in the merging and management of the class project chip set. The completion of digital subsystem projects, through at least layout, will be an essential part of the course experience for most of the students. Work on these projects will proceed at a rapid pace from the beginning of the course thru mid-November, at which time selected completed projects will be merged for implementation. The remaining project layouts may undergo iteration till the end of the course. For all this to really be feasible requires certain software facilities and some sort of graphics plotter. There must be software, and computing facilities accessible to all students, for the input and editing of symbolic layout descriptions and their subsequent interpretation to generate CIF files. Ideally the layout descriptions would be given in a language such as ICL. Alternatively, the descriptions could be given directly in CIF. There must be a plotter, software for conversion of CIF files to plotter format, and software to interface/support the plotter. A rather simple subset of CIF2.0, supporting boxes at right angles and symbol definitions and calls, would be adequate for the above. I will provide a complete and documented starting frame targeted for several alternative mask and fab firms. The starting frame will be specified in the simple subset of CIF2.0, and will contain several alternative alignment marks, mask level codes, fiducial marks if required, scribe lines of appropriate profiles, line width testers, test transistors, and, possibly, electrical test patterns for sheet resistivity and line widths. A documented set of input pads with lightning arrestors and output pads with drivers, also in the CIF2.0 subset, will be provided for student use. This starting frame, along with the above facilities, will enable the forming of a multi-project chip set file for transmission to Xerox PARC via the ARPANET. [ The ARPANET will thus be used by M.I.T. and Xerox PARC, both of which are ARPA contractors, to demonstrate the feasibility of remote submission of student LSI projects to a fast turnaround implementation facility ]. This will be scheduled for early December. Final plots of the chip set will then be done at PARC from the CIF file, to verify successful composition and transmission. The CIF to PG conversion will be done at PARC, and software blowbacks generated for final checking of the PG files. The chip set will be implemented by silicon valley mask and fab firms. Wafers will be fabricated and shipped back to M.I.T. by about mid-January. During the latter part of the independent activities program, the wafers will be electrically tested and then diced into chips, and the chips then mounted, wire bonded, and functionally tested. VLSI system design course at M.I.T. The color photos of the 1978 M.I.T. multi-project chip set have arrived! I'm sending one out to each of you. Enclosed with each photograph is a detailed list of the class projects, and a map to help you locate specific projects in the photograph. Quite a few people have had a chance to test their projects. So far, the results are really very good, especially when considering the limited tools we used and the time pressure all of us worked under: I have reports that projects 3, 4, and 5 work completely correctly; project 6 has been partially tested, and works correctly so far; the important subsections of project 7 work correctly; project 12 works completely correctly except for a couple of inverted outputs; project 17 has some wiring bugs, but may be partially testable, and I hear rumors that a bigger and better version is planned! I'd appreciate hearing about any additional functional test results as they become available. If in the future any of you undertake research or development activities related to integrated systems, I'd be very interested in staying informed of your work. Also, if you ever travel through the San Francisco Bay Area, and have some time, plan to stop by and visit at PARC. Good luck to you all. 1. Sandra Azoury, N. Lynn Bowen Jorge Rubenstein: Charge flow transistors (moisture sensors) integrated into digital subsystem for testing. 2. Andy Boughton, J. Dean Brock, Randy Bryant, Clement Leung: Serial data manipulator subsystem for searching and sorting data base operations. 3. Jim Cherry: Graphics memory subsystem for mirroring/rotating image data. 4. Mike Coln: Switched capacitor, serial quantizing D/A converter. 5. Steve Frank: Writeable PLA project, based on the 3-transistor ram cell. 6. 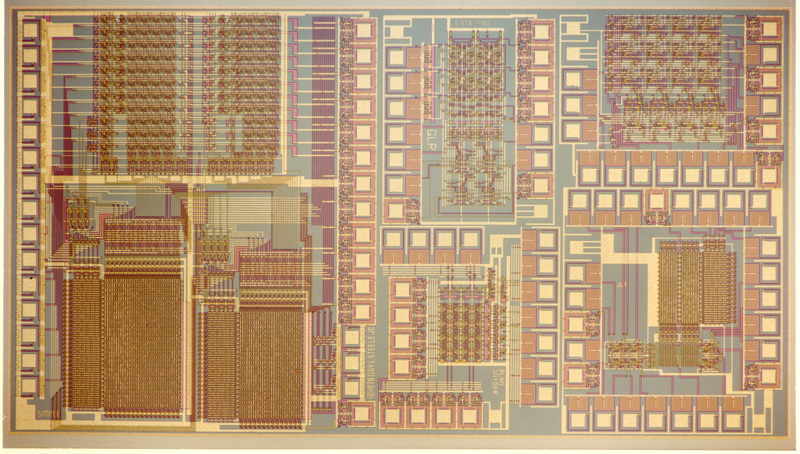 Jim Frankel: Data path portion of a bit-slice microprocessor. 7. Nelson Goldikener, Scott Westbrook: Electrical test patterns for chip set. 8. Tak Hiratsuka: Subsystem for data base operations. 9. Siu Ho Lam: Autocorrelator subsystem. 10. Dave Levitt: Synchronously timed FIFO. 11. Craig Olson: Bus interface for 7-segment display data. 12. Dave Otten: Bus interfaceable real time clock/calendar. 13. Ernesto Perea: 4-Bit slice microprogram sequencer. 14. Gerald Roylance: LRU virtual memory paging subsystem. 15. Dave Shaver Multi-function smart memory. 16. Alan Snyder Associative memory. 17. Guy Steele: LISP microprocessor (LISP expression evaluator and associated memory manager; operates directly on LISP expressions stored in memory). 18. Richard Stern: Finite impulse response digital filter. 19. Runchan Yang: Armstrong type bubble sorting memory. 20. Sandra Azoury, N. Lynn Bowen, Jorge Rubenstein: In addition to project 1 above, this team completed a CRT controller project. 21. Martin Fraeman: Programmable interval clock. 22. Bob Baldwin: LCS net nametable project. 23. Moshe Bain: Programmable word generator. 24. Rae McLellan: Chaos net address matcher. 25. Robert Reynolds: Digital Subsystem to be used with project 4. Masks: Micro Mask; Wafer Fabrication: HP Deer Creek; Packaging: M.I.T. A. Individual project design files, encoded in CIF2.0, were transmitted to Xerox PARC via the ARPANET during 5 and 6 December 1978. B. Files were converted from CIF2.0 to ICARUS format, and merged at PARC into a starting frame using ICARUS, based on a tentative space allocation pasted up at M.I.T. The overall design file was then converted to Mann PG format. C. Maskmaking began at Micro Mask, Inc. ~12 December, using their electron beam maskmaking system. D. Maskmaking at Micro Mask was pipelined during the next several weeks with wafer fabrication at Hewlett-Packard's Deer Creek Research Lab. E. Wafers (total of 41) were fabricated by 8 January 1979. F. Initial electrical testing and packaging were done in M.I.T. 's Materials Science Lab. G. Packaged chips, custom wire-bonded to individual projects, were available to students for functional testing by 18 January 1979. Link to a more detailed photo of the chip set.